Mumbai Indians take their first Champions League Twenty20 championship 2011 by beating Royal Challengers Bangalore with a superb bowling and fielding performance by the team. In the beginning of the tournament, Mumbai was regarded as the weak team in the tournament but in the end the weak team take the CLT20 championship 2011 winners with a dramatic win over Royal Challengers Bangalore. Due to injuries many of the major players like Sachin Tendulkar, Rohit sharma, Munaf Patel etc are not played in Mumbai Indians and still their hard work and dedication helped Mumbai to won the CLT20 Championship 2011. Harbhajan singh was the captain of Mumbai Indians in CLT20 2011 and he bowled a brilliant spell in the final match and took 3 wickets and two major wickets of Chris Gayle and virat Kholi who are the dangerous batsman of Royal challengers Bangalore. Mumbai Batted first and put a score of 139 runs which is a better score in this wicket. James franklin scored a brilliant knock of 41 runs which helped Mumbai to reach 139 runs. Malinga also scored some brilliant shots in the end. Royal Challengers Bangalore started their innings with some good hitting by Dilshan but In the third over, Malinga bowled a brilliant yorker to end Dilshan which is the turning point of the match. Apart from Harbhajan and Malinga, other bowlers like Abu Nechim who took two wickets, then Pollard bowled brilliantly with one wicket. In the end Royal challengers Bangalore innings come to an end with a score of 108 runs. Dilshan is the top scorer of Royal innings with 27 runs. Harbhajan Singh was awarded Man of the match in CLT20 2011 final match and Lasith Malinga was awarded Man Of The Series award in CLT20 2011. 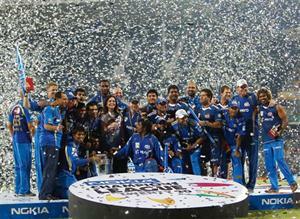 More details about the top scorers, top bowlers, awards and achievements of CLT20 2011 is given in the link. The pitch was tricky , but the Mumbai Indians target of 139 was attainable knowing the might of RCB'S batting .Then look what happened man of the match Harbajan Singh and man of the series Malinga broke the heart of RCB dismissing Gayle, Kohli, AND Dilshan. [ Who says it is a batsman's game]till then it appeared RCB would run away with the game. In this form of game mostly dominated by batsmen ,it is astonishing what Malinga does to batsmen time and again .He has proved to helpless looking bowlers that bowlers too can have the last laugh.